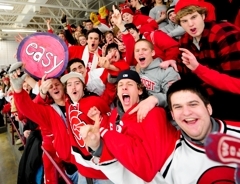 Fans were ariving at the Bloomington Ice Garden six hours before tickets went on sale. On a cold February night, the nearest parking spots could be found at Normandale Community College -- two blocks from the arena. Fans staked out their seats hours before the puck dropped in the first period. 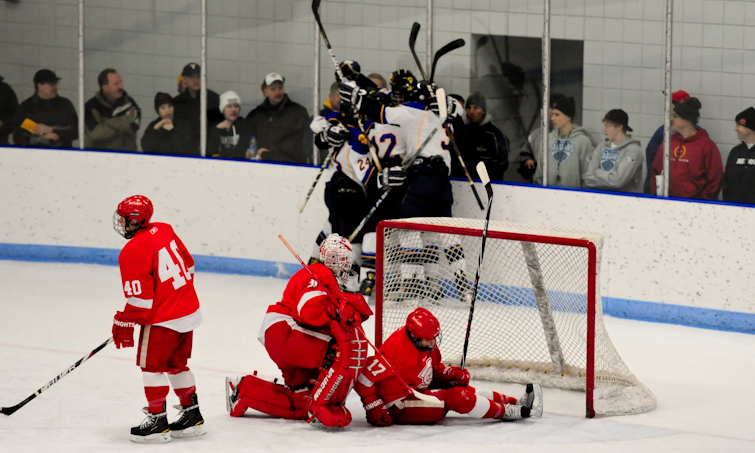 Nobody seemed to doubt the Section 6AA semifinal game between Benilde-St. Margaret’s and Wayzata would provide excitement. Those people got what they wanted and more. 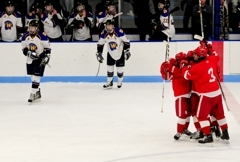 Though the two teams had not played each other during the regular season, neither program was oblivious to the other’s successful year. 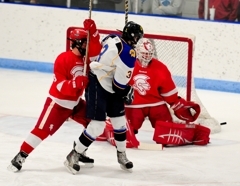 The Trojans won 6-3 thanks to massive production from Wayzata’s top line. 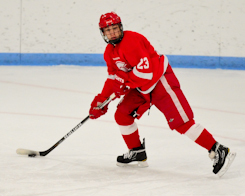 Senior forward Tyler Klein recorded his second hat trick of the season and Tony Cameranesi and Mario Lucia each added a goal and two assists. With Cameranesi being one of 10 Mr. Hockey Award finalists and Lucia listed high in the NHL midterm rankings, Klein’s offensive explosion seemed to come from nowhere. Not the case, according to Davis. “He’s been a finisher his whole career at every level, and he showed it again tonight,” Davis said. “It was pretty amazing that Tony had two breakaways and three two-on-one’s -- all three of those were with Tyler and they converted on two of them. For him to be able to make those plays at that time in the game that was a huge boost for us. Klein said the performance felt good. 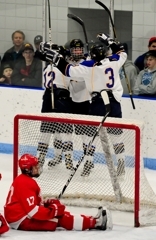 Just like any top line at any level, Wayzata’s starting three has had its on and off nights. Occasionally, they won’t click as well. 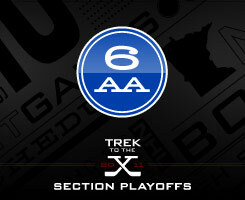 Other nights, their production is similar to the Saturday, Feb. 26, game against Benilde-St. Margaret’s. Klein, Cameranesi and Lucia combined for 10 points (five goals, five assists). 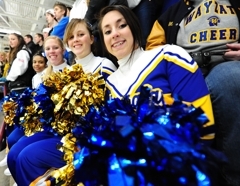 Their efforts played a major role sending Wayzata to the Section 6AA championship game where the Trojans will take on Lake Conference rival Eden Prairie. “We think we can play with them – there’s no question about it,” Davis said. “We tied with them 3-3 early in the year and then they beat us 4-3, but both games were very close as well as up and down. They love to skate, we love to skate. The rest of the Trojans seem to agree. 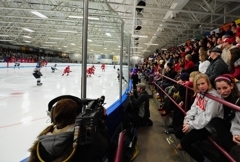 Although smiles were a-plenty on the Wayzata side of the arena and in the Trojans’ locker room, the harsh reality for the Benilde-St. Margaret’s fans and team was tough to endure. 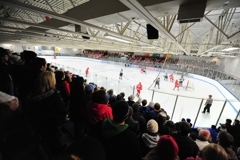 After several minutes alone with his team following the game, Benilde-St. Margaret’s coach Ken Pauly emerged from the Red Knights’ locker room. “Well, it’s never the speech you want to give,” Pauly said about his postgame comments to the team. “The fact is you’re going to say a goodbye speech no matter what in the next couple weeks, most teams are saying them in settings just like this and unfortunately it was us tonight. We had a hell of a team. Pauly was noticeably disappointed and sad about the game’s result but proud of the way his team played. “They could have cashed it in when it was 5-1 and they continued to battle, I think that says a lot for them,” Pauly said regarding his team’s effort. “They played that way all year. I think they distinguished themselves by not quitting. 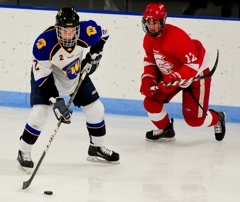 Rosters for Wayzata and Benilde-St. Margaret’s featured former teammates and several friends. “The problem is you’re not going to win these games if you’re not scoring on the power play,” Pauly said. “Our power play failed us tonight, there’s just no other way to put it. You can’t win these games if you lose the special teams battle. We had a five-on-three opportunity and we didn’t generate much. In this atmosphere, sometimes kids start doing things they haven’t done all year and I really got the sense that we were doing that. That’s too bad. 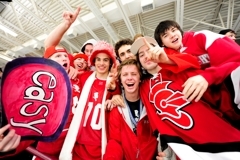 The Red Knights also featured a talented group of seniors led by co-captains Patrick Daly and Patrick Steinhauser. “It’s difficult every year,” Pauly said. “Any coach will tell you the seniors who are with you have usually been with you are usually with you for three, four years. It’s especially difficult when you have people of character like Patrick Daly and Patrick Steinhauser. Daly has been with us for four years and I’ve seen him grow up. Steinhauser has been with us for three. 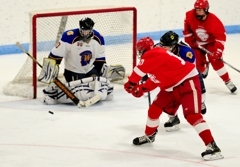 Benilde-St. Margaret's junior forward Christian Horn (left) draws the attention of Wayzata defensemen Marc Richards (No. 25) and D.J. Jones (No. 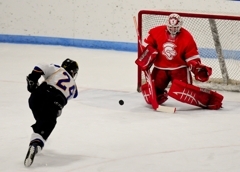 24) as well as Trojans' goaltender Aaron Dingmann during the Section 6AA semifinal game on Saturday, Feb. 26. 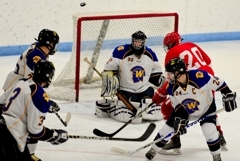 Tyler Klein notched his second hat trick of the season and Aaron Dingmann made 30 saves as Wayzata defeated Benilde-St. Margaret's 6-3 during the Section 6AA semifinals on Saturday, Feb. 26, at Bloomington Ice Garden. 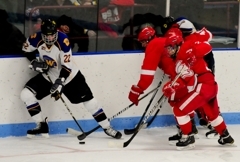 Mario Lucia and Tony Cameranesi each contributed a goal and two assists for the Trojans (20-5-2). 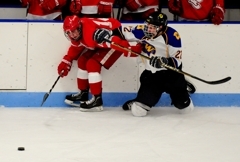 Benilde-St. Margaret's sophomore forward T.J. Moore registered two goals and junior forward Christian Horn scored once for the Red Knights. 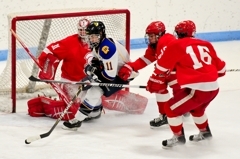 Justin Quale made 22 saves for Benilde-St. Margaret's as the Red Knights finish the season 22-5-0. 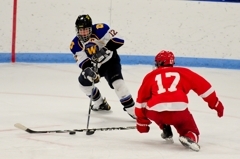 Up next for Wayzata is the Section 6AA championship game against Lake Conference rival Eden Priarie on Wednesday, March 2, at Mariucci Arena at 8 p.m. following the Section 2AA championship between Edina and Burnsville. 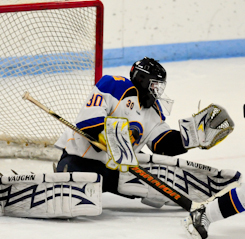 People may have come out to Bloomington Ice Garden to see the Tony Cameranesi and Mario Lucia show but don't forget about Tyler Klein. The senior forward picked a great time to register his second hat trick of the season and also assisted on Lucia's first period goal. Klein had several two-on-one chances with Camereanesi or Lucia and capitalized. 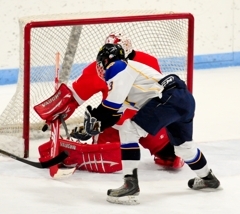 The Trojans can definitely score but goaltending was a question throughout the season and looking at the Section 6AA playoffs. 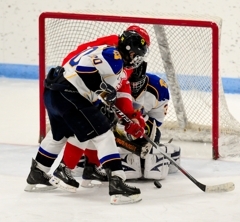 Dingmann may be the answer Wayzata was looking for. The sophomore goaltender was stellar in-between the pipes making 30 saves in the semifinal battle. 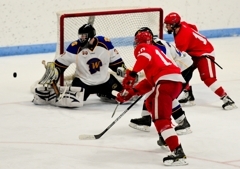 The Red Knights needed to capitalize on every chance they could get and Moore seemed to be up to that challenge. 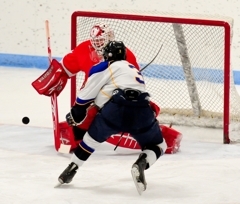 The sophomore forward buried two goals for Benilde-St. Margaret's, both of them with plenty of room to get a shot off with a great look at the Wayzata goal. 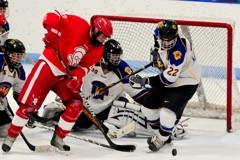 On a night when Red Knights' scoring threats Pat Steinhauser and Grant Besse were kept out of the goal scoring column, Moore stepped things up.